Keeping your online accounts safe from your home computer can be difficult enough, but you’re at serious risk if you surf from an Internet cafe. The machine you’re using is not trusted and anyone could have installed all sorts of viruses, keystroke loggers, and scanning software to view your screen. The problem is that most of us need to check out the Internet for a variety of reasons while we’re away on travel. Here are some good ways to keep your online accounts safe. Create a Dummy Email Account, and Have Your Messages Forwarded There – The easiest way to do this is to set up automatic forwarding on your personal (and work) email accounts. Almost all of the major email providers (Hotmail, Yahoo, etc.) support this functionality. Look through the settings and you’ll be able to set this up in about 3 minutes and all you need to know are the two email addresses. If you’ve got Gmail, it’s very easy to do. Here’s how. Use Meebo To Login To Your IM Accounts – Both Meebo and Trillian encrypt your Instant Message passwords so hackers can’t steal them as easily when you login. IM accounts often don’t contain much value, except to send malicious downloads to your friends. Meebo is an online service that lets you log in to your AIM, MSN, etc. account using your existing username and password. There is no stand-alone software that can be manipulated – just remember to change your passwords when you get home. Type A Bunch Of Random Characters In Notepad, Then Copy/Paste Your Password – Many Internet cafes have “keystroke loggers” installed on them, that is, the machine records everything that is typed on the keyboard. This information is then sent to some hacker somewhere. You can get around these types of attacks by typing in a bunch of random characters in Notepad (or equivalent) then copying the letters and numbers that make up your password. Download ‘Safekeys’ To A USB Drive and Install It – This tiny program runs directly off of a USB drive and creates a little keyboard you can use to click on with a mouse. Since you’re not using a keyboard, it won’t register anything in case there are keystroke loggers installed on that Internet cafe PC. 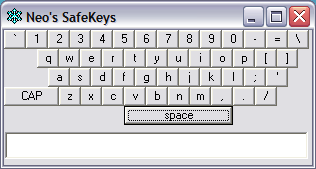 Safekeys is a free download. Don’t Access Any Sensitive Accounts (Most Times You Can Avoid It Until You Return Home) – An obvious one, but it’s not a good idea to check your bank account, personal email, or other sites that may be sensitive depending where in the world you are visiting. There are many parts of the world where you may not want anyone to know your nationality or would want to keep your browsing confidential. The best bet is to bring your own laptop and install Tor which hides your Web trail. Make Sure Not To Store Any Passwords – Many Web browsers will ask you “Do You Want To Save This Password?”. Make sure that you always read carefully and answer “No”. In case you accidentally save a password (for Internet Explorer) double click the password box. You’ll get a drop down of the stored passwords – highlight your and hit the “delete” button. For Firefox, click Tools > Options > Privacy > Always clear my private data when I close Firefox. Evaluate Your Environment – In general, if you can install anything on a PC in an Internet cafe, you most likely have administrator privileges. That means so did everyone else who used that computer before you. A multitude of pop-ups, crashes, and other flaky behavior should be taken as a warning to not access any account that might compromise you security, privacy, or bank account – even with the precautions taken above. 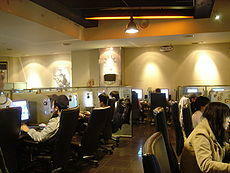 Simply move to another computer, or better yet, another Internet cafe. Keep in mind that large Internet cafes run with ticket systems (like those in central London) and that have cafe-specific software installed on them tend to provide better security. Remember that flight numbers, phone numbers, and such can be found with a little Google hacking. Work will be less of a nightmare when you return if some teenager in Thailand can’t jack access to your email account. When you do bring your own laptop along, still be weary and never connect to computer-to-computer networks. The best advice is to enjoy your vacation, check how much money you blew on souvenirs and email those naughty pictures to you-know-who after you get back home. Thanks – I read about that sometime ago and thought it was a nifty trick. As an afterthought I’d also recommend using the portable versions of Firefox and Thunderbird to run off of a USB stick – but that takes a bit more setting up before you leave for vacation. Super advice. I don’t use internet cafes as much any more since I travel with my own laptop – however there are times when it’s necessary. I love the idea of a ‘dummy’ email account where you don’t keep anything personal – excellent! I had also never heard of the Safekeys app. Many people don’t consider email a ‘sensitive’ account like bank logins for example. An email account is a great way to steal information to a number of other accounts. Also most people use the same passwords for all of their online accounts – chances are if someone gets you email password they’ve got your bank, Twitter, Facebook, etc. as well. Great tips and I’m going to include them in my travel arsenal. Sometimes using an internet cafe for these things is unavoidable. It is best to be prepared. Can you explain a bit more about forwarding your email. This concept is great for reading the email. If you want to reply however, you will need to log-into your original account, else the reply address will be the forwarded account. This will confuse the receiver no end and I have people who cannot keep my personal and my work account addresses separated as people will generally just reply to the latest email you sent. There is also a neat way to use the program Thunderbird to do this as well. You can set up a portable version of the email client (which is like a free version of Outlook) on a USB drive and use this plug in below to make the “From” address from which ever account you like. Let me know if you need help or any step-by-steps for either of these options, I’d be happy to help.